The week is on track to post some solid gains, thanks entirely to a sharp price hike on Monday. Since Monday, prices have generally held steady, as markets process the massive gains seen in recent weeks. In just two weeks, prices have gained over $4/bbl, an 8% gain. Just one month ago, markets were still speculating on whether prices could reach $55 by year-end; now a growing number of analysts are mentioning $70 as the new ceiling price. Of course, many major investment companies are cautioning that this rise was expected, and the overall outlook for prices has not changed too significantly. Crude prices picked up over a dollar (1.9%) this week, rising from $55.97 at the opening call on Monday to $57.02 this morning. 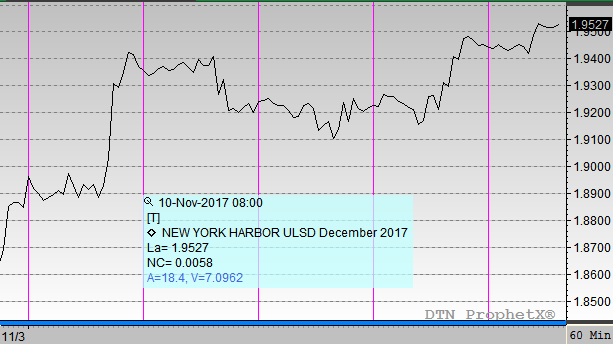 Virtually the entire price gain came on Monday when prices gained $1.38; prices have trade steady to slightly lower since then, unable to close as high as Monday’s $57.35 close. The average closing price for crude this week has been $57.13, a full $2.50 higher than the average closing price last week. Diesel prices saw much stronger gains than crude oil, picking up 6.4 cents (3.4%) during the week to open this morning at $1.9365, the highest opening price for diesel since June 2015. 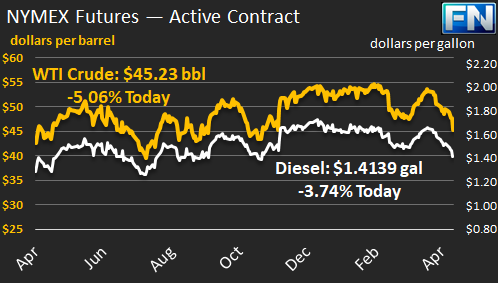 Like crude, the majority of the gains this week came on Monday, though after struggling towards the middle of the week diesel prices did pick up 2.2 cents on Thursday. Diesel demand has been strong worldwide, contributing to the strength in prices. Gasoline prices have seen much more volatility and lower gains, with prices moving 2.85 cents (1.6%) higher between Monday and Friday. Prices received a solid 4 cent boost on Monday, but volatile trading during the week worked some of that away. The API reported a small stock build for gasoline, causing prices to plummet on Tuesday, but a strong draw reported by the EIA on Wednesday helped gasoline prices recover slightly. Market-moving news this week has been centered in the Middle East, with the Saudi-Iran conflict at the center of attention. Ever since Iran-backed Hezbollah forces fired a missile at Saudi Arabia, tensions have been extremely high. Compounding the problem is ongoing political strife within Saudi Arabia, with an anti-corruption campaign imprisoning several major leaders in the country, paving the way for the Crown Prince to take power. The Crown Prince is strongly committed to reducing global oil inventories, so his rise to power has been perceived as bullish for oil markets. A bullish EIA report this week has also helped support markets, especially refined products. 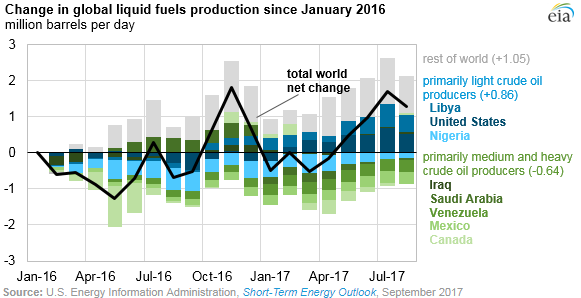 While the API showed a draw for crude and diesel and a build for gasoline, the EIA showed a 2 million barrel build for crude along with a 6.7 combined draw in diesel and gasoline stocks.